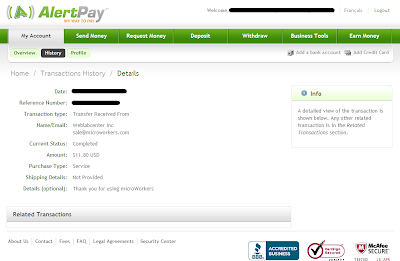 Earn decent money with microworkers ~ Download Everything You Need ! When you start first with opening an account, be sure to give your address correct. This is required when you will be withdrawing your first payment. Microworokers will send you a pin to your address and you must put the pin in the required field for verification. Then they will transfer your money to your online account. Do not open account by using a proxy IP or through a proxy server. It will result in banning your account permanently. In your first day you will have many jobs available but after submitting 20 job, you have to wait for rating those job as satisfied/not satisfied by the employers. In that time your temporary success rate goes below 75% and you can't do more jobs then as it is one of the rule for the first 60 days and the rule says that below 75% temporary success rate you can't submit any jobs. If any employer forgets to rate it, don't worry, it will be rated automatically satisfied after 7 days. So my suggestion here to open a 2nd account in Microworkers. If you have 2 modem or someone using internet but not working in Microworkers or if you can manage another IP address, open a second account changing only name. As they will verify your 2nd account's address also, give address of any reliable relatives/neighbors/friends who will inform you after getting your pin. You are guessing what is this? OK. Let me discuss. Most of the job is here like : registering someone’s products through different email address. Same kinds of jobs come again and again in every week even on same day. In that case you will be struggling to complete the job when you will see that - " This e-mail is already been registered". That's why i suggest creating 1 account in every week in a certain day like: Sunday, Monday. Account should be in yahoo.com, gmail.com, hotmail.com. Gmail is faster than others. You have now a question that - "IS IT ETHICAL,WHY WASTING UNNECESSARY ONLINE SPACES ?" Well....email service providers will deactivate your account after certain period of time, yahoo needs six months. So there is no harm to anyone or any service provider. Yahoo answer account for Microworkers job is must. There are lots of yahoo answer related job worth $0.20. These are one of the easiest jobs in Microworkers. Just answer to a certain type of question and put the employer' link in it. That's it.The account should be in level 2. Why level 2 ? In level 2, you can provide link which could be click; clickable link. Employer needs there website to be followed by other and your yahoo answer account will be promoting their websites. Login with your existing yahoo account in YAHOO ANSWER. Then select get started from the right panel of welcome screen. You need to accumulate 250 point to upgrade your yahoo answer account in level 2. You will get 2 points for every answer given for any question, 10 point if your answer is chosen as best answer, 100 points after you first join in yahoo answer community. So you have to wait for a long time to upgrade your yahoo account in level 2. Reason behind this criteria is- when you choose 7days old question which is still open to be answered but there is no answer and now when you are answering to that question, there is 95% chance that your answer will be chosen as best answer. As you are now in level 1, you can answer to only 20 questions in any single day. Do this for your 4 yahoo account. This will hide the bad activities form others (what you are going to do) in yahoo answer community. Otherwise they will report it to yahoo and ban your account. Do this for 3 fake yahoo accounts. This will make the 3 account to be in the real account's network. It will help you to find the question/answers of your network easily. Now make 5 questions from each fake account. Question could be anything. You will have 15 questions now to answer. Make answer of each of the question from real account. Find the question from my activity>my network activity. As i have discussed earlier, after submission of 20 job, you have to wait for rating those. But do not waste your time if you want to earn some good. HG job will be available in this time. Try to grab those. Those are little money but after one month you will realize how they have contributed in your main balance. Another thing is that, if you have not still register / open any account in online payment systems, MONEYBOOKERS or ALERTPAY will help you. Microworkers is now supporting only these options. Do it now and then verify your accounts. Sometime it will need a long time for verification for some issues. So use this unemployed time in there. Try to make accounts in different websites. Especially in Facebook, Twitter, Digg, Stumble upon Ghigg, Reddit and Google Plus. Make sure you are using fake account in those services otherwise everything will be mess up and when you are marketing for a website/link/product in your status, everyone will find you as a sells person or a scammer. Lots of works in microworkers are like: post in your Facebook wall or tweet by your twitter account. Some employer requires you to have 350+ friends in Facebook and 100+ friends in twitter. Otherwise you will not be able to submit those jobs. If you don’t have that amount of relation in those accounts, don’t worry. I m here to help you. At first, you have to overcome with your shyness. Then send request to everyone who have at least one friend in common in Facebook. For Twitter, follow the friend suggestion and follow them whoever they are. They will not follow you always but at least 40-50% will follow you back. So, now you will have 350 Facebook friend and 100 twitter follower. You did great!!! This is a common problem for all of the Microworkers. To avoid this problem, you have to be very fast in doing jobs. Try catching those jobs which have status like 50/100 and avoid 95/100. What this means? 50/100 means that the job requires 100 people and 50 people have already submitted. Others are doing this but you don’t know how many. So that’s why you have to be fast. This is not FIRST COME FIRST BASIS rather FAST SUBMIT FAST BASIS. Now comes the pain. Sometimes you see that when you submit a job, it says – job has been paused. Now? All of your effort has in vain? No. Never. I am here to help you. Open a notepad and named it after the job status like: YouTube account create, facebook like, Germen friend finder signup etc. Sometime you will have this same problem in same types of jobs multiple times. In that case you can create a folder and keep all the related notepads into that. Why this pain again i am suggesting you? Because you will see that same types of job coming many times, even twice in a hour/day/week. In that case you just match the criteria that employer needs and then just submit it. In this time you have nothing to do. See how easy this is !! But remember one thing, do not submit this information again into another job otherwise you will be flagged as red mark by the employer and 3 red flag will ban your account. So.... lots of suggestion here. I hope and believe that you will surely earn good there. I will come up again with new problems and suggestions. Keep looking. Your feedback is highly appreciated.